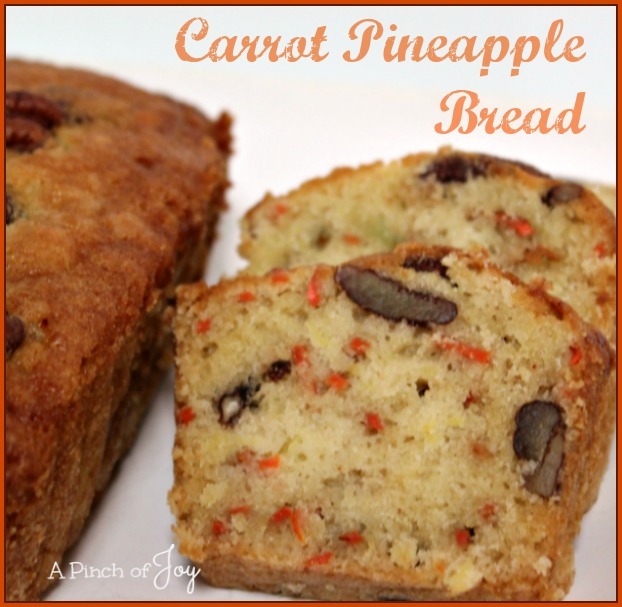 Carrot Pineapple Bread is a delicate and delightfully pretty bread. It makes a nice addition to a tea table or an afternoon dessert buffet. Use a sharp knife to cut so the slices don’t tear. We inhale this plain, but it would be nice served with whipped cream cheese or a light lemon flavor whipped butter. This is quick and easy to assemble. I use a 10 ounce bag of shredded carrots from the grocery because I like the convenience. Save back a few nice looking pecan halves to put on top of each loaf before baking. Guarantee the carrots in this are good. And the little loaves are delicious. It will win a kindergarteners heart – and his momma and daddy’s and sister’s too! A delicate flavored, delightfully pretty bread that is so quick and easy to make! Grease and flour five 5 ½” x 3” loaf pans. Mix dry ingredients in medium bowl and set aside. In large mixer bowl, beat eggs and oil at medium speed until well blended. Add sugar and continue beating until mixture is thick, about 2 minutes. At low speed, beat in carrots and pineapple. By hand, stir in flour mixture just until flour is moistened. Stir in nuts. Divide batter equally among the five pans. Bake for 50 minutes or until a wooden pick inserted in center comes out clean. Cool in pans on wire racks for 10 minutes. Remove from pans and cool completely. Breads can be wrapped in foil and stored in the freezer up to three months. This looks awesome and so tasty too! Thanks for sharing at the #WWDParty. I love the story about the little boy! This bread sounds delightful. I can’t wait to make it. Thanks for sharing. Thank you! I hope you like the bread and I am so glad you enjoy reading A Pinch of Joy!